28 x 58 x 45 Inch - SHIPS FREE! 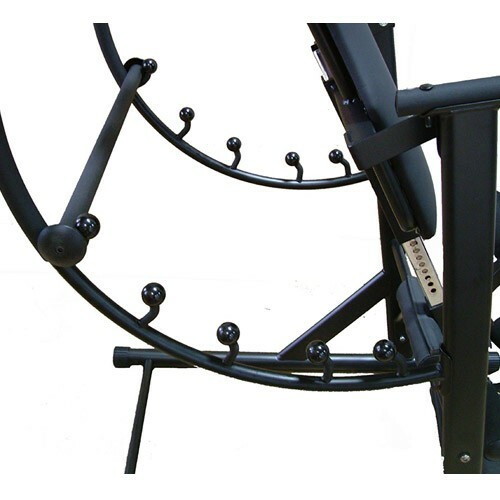 The Pro Max Inversion Table by Health Mark makes it easy to decompress your spine and also get a good workout. The comfortable, firmly padded bench is designed like a massage table with an open area for the face, ideal for face-down positioning. The table is also capable of front-facing positioning for abdominal workouts. This sturdy table has a tubular steel construction and comes with an easy-to-use latch and lock ankle bracket that allows for 180 degree inversion. The Pro Max has six preset angles that allow for gravity-traction. This type of traction stretches out the spine, increases mental alertness, and increases blood circulation along the spinal cord. It has been proven to reduce muscle stress and fatigue and reduce lower back pain. With an impressive weight capacity of 600 pounds, the Pro Max will help you get the best workout possible.